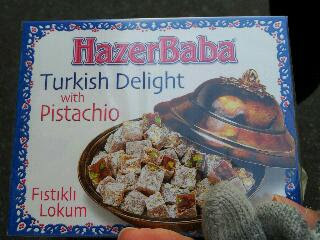 Have you tried Pistachio Turkish Delight?! It's a must! I'd tried the others, but this was my first tasting of the pistachio ones, and I am in love! N and I got it from this bakery. 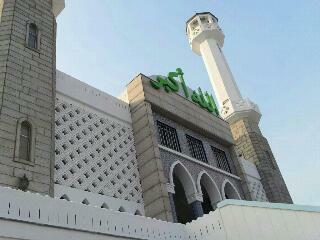 We were on our way to the Islam mosque when we came upon this little place. We were going to the mosque for several reasons. One, because I was curious. But the bigger reason was two, because I wanted to try out some Arabic sweets like the ones I had at the mosque in Paris. The mosque in Seoul is in Itaewon, and since I was already in the area for brunch, I thought I would take N along to check the mosque area out, in the hopes of finding some Arabic desserts. There were many Turkish and Pakistani restaurants on the way. Salam bakery stood out and so we hopped in. 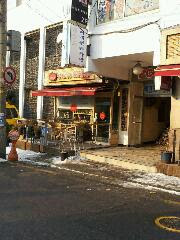 Salam bakery is next to Salam restaurant. Actually there are two Salam bakeries, one near the main Itaewon road near exit three of Itaewon metro station, and the other further inside, right next door to the restaurant, which is the one we went in. Inside there were two counters with, mostly, baklavas, and Turkish delights. Near the walls were teacups and shisha equipments. There were one Arab boy and one Korean girl looking after the shop. The boy didn't seem to speak much Korean, but gave us a lovely smile when I said thank you in Arabic. 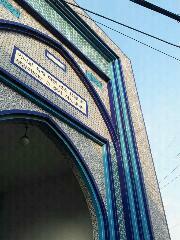 I think the blue tiles of the mosque are so pretty. I want beautiful tiles in my dream home, too.